Big shopping buildings define the area of T.Nagar but it can be defined with the other landmark in Pondy Bazaar. That landmark is none other than EVP Rajeswari Marriage Palace. 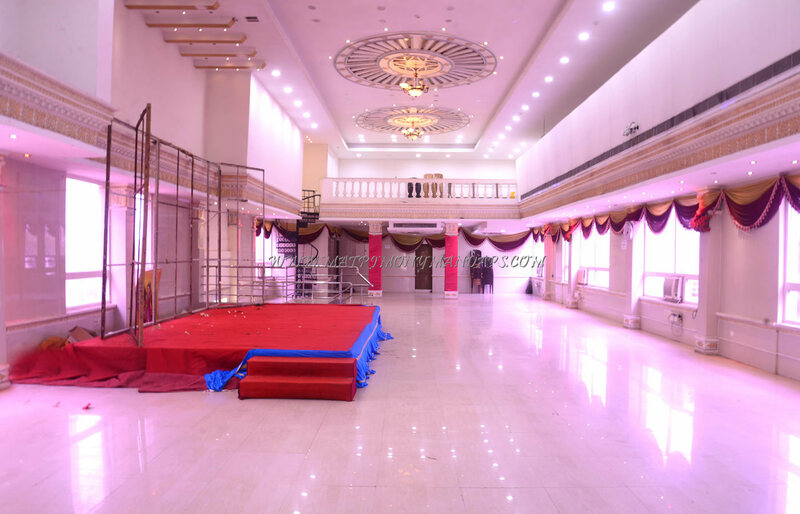 The marriage hall is famous for its palace kind of interiors, exteriors and a spacious hall with a seating capacity of 500 and floating capacity of 700. The marriage hall looks extraordinary with the tall glass building, intricate interiors with golden paintings, curtains decorating the walls and chandeliers hanging from designed ceiling. EVP Rajeswari Marriage Palace has the necessary facilities to execute the function. The wedding hall is provided with generator back up for the events to not get disturbed in case of power failure. There is lift access to hall and dining hall. The wedding venue is furnished with rooms and safety lockers. There is valet parking for guest’s vehicles. The catering services include availability of kitchen vessels and cooking fuel. The guests can have their food preference as outdoor caterers are allowed. EVP Rajeswari Marriage Palace in T.Nagar is sure to exceed your expectations.